It's NXT Takeover 7: Respekkkkkkkk! (Booker T used to reiterate the word respect in the Main Event Mafia, it was amazing.) It's October 7, back at Full Sail University, FL in front of 400 fans. Let's do it to it! The first of 3 tag matches, the semi-finals and finals of the Dusty Rhodes Tag Team Classic for the #1 contenders to the Vaudevillains’ tag belts. Finn’s not in demon attire, but in a leather jacket like his Real RockNRolla jacket without Jericho’s lite-brite! The bigger story is the slow build for Joe vs Finn. On the weekly show, Joe went to tap Finn but hit his belt instead, and looked at it for a little longer. Great. Finn and Joe start off hot, leading to a big tope to the outside. Tide turned with a chop block to Balor’s left knee. Dawson and Wilder work over balor’s left leg presumably to take out his coup de grace but the commentators don’t explain it. (I got so many tweets relating it to Owen and kicking his leg out of his leg, hilarious). Pasty non-flashy Dawson and Wilder look like such enhancement talent, esp. as they’re overlooked to focus on an upcoming NXT title feud. Unintentional distraction where Joe leaves the apron (and Finn high and dry) when he looked for a hot tag. Despite a hurting knee, Finn asks Joe (who’s putting in a clinic) to tag him in so he get do his finisher. Annoyed but accommodating, Joe tags him in and awkwardly Finn hits the coup de grace (his pride getting the better of him as he further injures his knee) and the win to advance to the finals. Enjoyed the story but it was a short match, see you later on lads. The match focused on the amateur wrestlers. Both Gable & Jordan work over Rhyno, Jordan looks far more impressive sprawling on the mat and man-handling Rhyno. Jason gets the hot tag and does the amateur pickup into the corner and even the Kurt angle straps down, shouty firing up schtick. Near falls, Gable hits a roll-through German suplex on Corbin, very impressive. Tilt a whirl End of Days to Gable, looked awesome. So Rhyno/Corbin will meet Finn/Joe in the tournament finals. Kana debuts in NXT! In addition to being a stiff Japanese wrestler, she’s a massive gamer, used to write for Xbox magazine and designed graphics for the Nintendo DS. How awesome is that. Brooke has a glowing orange tan and heel Emma looks sickly. I kinda felt bad for her as Asuka has come in an immediately leap-frogged her career-wise. Anywoo, this is an exhibition match to showcase her style and get her character across. Very cool to see her draped in Japanese attire and she showed lots of personality mocking Dana’s mannerisms (kinda like Liger against Breeze last time). She looked very fluid, put over her kicks, suplex and litany of submission offense. Love it! It’s also very cool to see a WWE show making a big deal out of a Japanese wrestler (as opposed to what we’re used to in Ultimo Dragon or TNA’s use of Tanashi & Okada. Much quieter entrance this time for Breeze, he was really just Crews’ opponent. Poor wrestling psychology in this one as Tyler works on Crews’ lower back, including a sharpshooter spot, but Crews did a press slam and then a big powerbomb for the win. Not impressed. Breeze always performs well so his matches are enjoyable (despite what I just said). How is Crews’ mic work? His acrobatics/power moves and look are both great so that’s the big question mark. The heels have the absolute majority of the offense; working over Joe until he gets a hot tag – he runs wild until his knee bothers him and Rhyno chop blocks him, and the heels dominate for a long stretch. Despite this, he managed to survive to give Joe the hot tag, countering the Gore with a muscle buster, and just like earlier tonight, Finn hit the coup de grace and got the pin and the win. It was oddly low key, so Finn & Joe face the Vaudevillains in December at NXT Takeover London. Afterwards the Rhodes Family awarded the trophy to Finn & Joe, Cody (not Stardust) cutting a nice, emotional babyface promo giving reverence to his dad. With a large flower bouquet and spending ages posing for pictures with a trophy, it’s really New Japan of them. Awesome. Joe is super-smiley throughout the celebrations (even at the end when he’s beside Claire Lynch!) and Finn’s RnR leather jacket suits a heel better so it’ll be great to see what they come up with. I expect the long term booking would be Finn tagging himself in to do the Coup de Grace backfiring and causing himself and Joe to lose to the Vaudevillains in December; adding fuel to the fire. The crowd (and everyone who watched it) were absolutely amped for this match. Bayley’s win last time at Brooklyn was a MOTY contender and Benoit/Angle’s 30-minute Iron Man Ultimate Submission from Backlash 2001 is one of my very favourite matches. 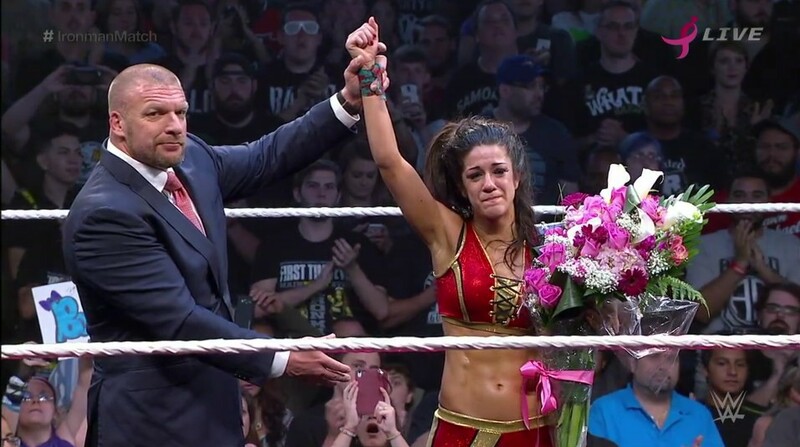 The audience flip out and constantly chant, imparting their love onto the performers – Bayley had a hard time not crying for the first few minutes. They didn’t have the timer on for the entire match (boo!) but the camera did make sure to include one of the screens (with the timer on it) so we’d know. I was impressed that both women worked a fast pace throughout, it looked like they could’ve gone for much longer. They referenced/worked off spots from the prior match, like Sasha countering the top rope reverse hurricanrana, Bayley trying to injure Sasha’s hand this time, and Banks accepting a hug (like the end of Takeover Brooklyn) only to pull her hair and slam her to the mat. Another great heel spot, Sasha blocks the ref’s vision with her body, pokes Bayley in the eyes and gets a schoolgirl to go 1-0. Bayley hit her finisher to even it up 11 minutes in. Izzy, Bayley’s biggest fan, plays a bigger part as WWE panned to her throughout the match, they went full out tugging at the heartstrings. After Sasha throws Bayley into the LED board, she gets counted out so Banks is up 2-1. Sasha gloats and heels out by throwing her glasses at Izzy, taunting her. And wow. MAKING KIDS CRY BRAH. This is hilarious how hard WWE are pushing for an emotional response. This plant is worth her weight in gold. Bayley tried a few times to do a sliding dropkick underneath the bottom turnbuckle to the outside, it didn’t look great. Bayley’s cookin and evens things up with a roll up, and into the final 3 minutes. Bayley hits a super bayley to belly but over-folds up Sasha, whose feet touch the ropes. Sasha hits the bayley to belly and into the Banks statement, as Bayley sells for a long time. Great storyline sense as Bayley hurting Sasha’s hand means that she can’t apply the Banks statement well, where Bayley’s able to escape and put on a variation of the rings of Saturn, and (kinda viciously for Bayley) pulls on her fingers and kicks the head of Banks, who verbally submits with a few seconds to go! Bayley retains in a great main event. I don’t think the crowd copped the submission finish initially. Afterwards the roster (who’re all showered up and in street attire) are at the entranceway and congratulate them, Banks stays at the entranceway and Bayley celebrates in ring. Fantastic way to cap off a great performance with superb booking. I mean it as a compliment, but I think this match didn’t have enough time. Sasha didn’t get to dominate for long or open up a lead, despite having 30 minutes, the story they portrayed had a lot of plot points and moved along at a brisk pace to fit everything in. That’s quite a statement for a women’s match! I preferred the Brooklyn match but this was still superb. A Christmas-time feel good finish to another great NXT PPV. Overall: Very solid show top to bottom, only small quibbles: Breeze’s match with the nonsense psychology, and the semi-final tag matches were more engaging that the finals. Positives: continuing to slow build Joe vs Finn, very high hopes for Asuka, lovely moments with the Rhodes family and the final celebrations, and of course a great main event headlined by deserving female talent. Oh and brahs sporting the WHAT BARRRRRRRR tees! That’s so awesome to see! So what did you make of the show overall? Did you prefer this women’s match or Takeover Brooklyn’s match? Would you rather see Joe or Finn turn heel, or both feud as babyfaces? Mick Foley Dublin Gig #2!